One of the larger states,and an industrial powerhouse of India, Maharashtra, is located in the middle western portion of the country. It includes several hundred miles of beautiful Arabian Sea coast, dotted with coconut trees. Coconut meat is a big feature of Maharashtrian cuisine. One of the regions most popular dishes, Batata Murghi is an easy to prepare, one-dish meal, that includes a tasty blend of coconut and spices to flavour tender chicken strips. It's a terrific blend of sweet and spicy. 1. Peel and cut the potatoes into 8 wedges each. Cover them, bring to a boil and simmer until just tender (10-15 minutes). Then drain. 2. Heat 1 tablespoon (15ml) of oil in a big skillet or wok over a medium flame. Stir fry the garlic until it is just barely golden. Add the coriander seed, coconut and chilies. Cook 1 minute, stirring all the while, until the coconut is golden. 3. Place this coconut mixture in an electric blender with a ½ cup (125ml) of water and whirl on medium until it's smooth. Put aside for now. Wipe skillet. 4. Heat the remaining oil in the skillet on medium. 5. Make sure the chicken is dry. Cut it into strips the size of your small finger and toss with a little cornstarch to keep it tender. Cook it in the oil about 3 minutes, stirring now and again, until it is golden. 6. Add the coconut mixture and all other ingredients except the coriander leaves to the chicken. 7. Lower the flame and simmer uncovered about 10 minutes. Stirring often until done. 8. Garnish with chopped coriander when serving. 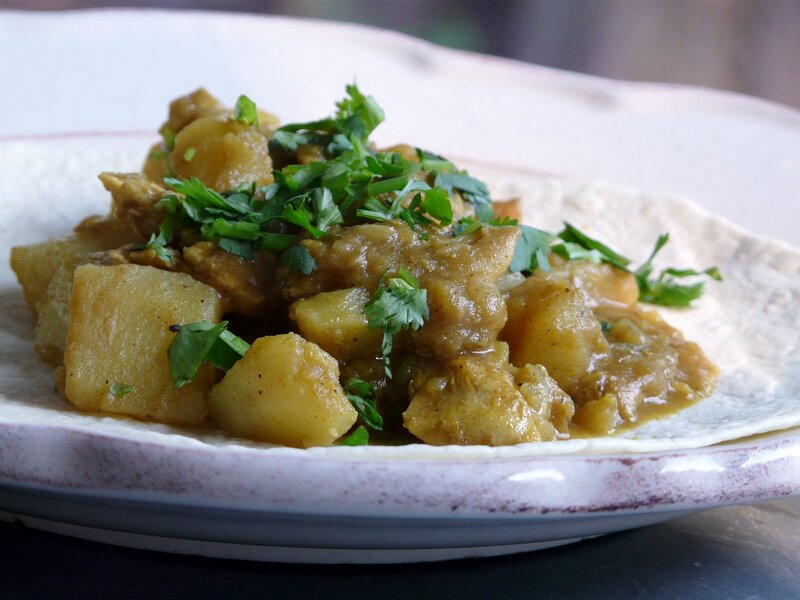 Batata Murghi, with its spices that tantalize your palate, can also be prepared with lamb or goat meat. Either way you're sure to enjoy this fragrant, and exotic Indian dish. Try this dish at your next party. When your guests arrive they will be greeted by spicy aromas that will make their mouth water as it piques their curiosity.